Have you ever wondered how the Internet, computers and video games happen? How exactly does your computer manage to display the words you are reading right now? Does it feel a bit like magic? To know the secret underlying the entire digital world, whether it is your iPod with 10,000 of your favourite songs or Facebook.com or that new Android phone, is to know nothing more than a series of 0's and 1's. All of this technology is just a wonderful, nay, genius, application of good old maths. While our precious Earth has existed for billions of years, and we Homo sapiens have been plodding about for something like 100,000 years, computers did not even exist a century ago. So what on Earth caused this dramatic and epic digital revolution? The short answer to that question is the binary system. To make sense of the binary system, it helps to briefly revisit a very popular system related to binary, that being the decimal system. The decimal system is what most modern civilizations use to make numbers. When you think of any number, for example 42 or 0.007, what numerical ingredients did you use to make these numbers? The answer is rather trivially the 10 digits of 0, 1, 2, 3, 4, 5, 6, 7, 8, 9. It doesn't matter what number we are talking about, you must use that pool of 10 digits. Some people surmise that the reason we use 10 digits is because we ourselves have 10 digits, namely our fingers and our toes. What is an often overlooked fact is that we do not have to use 10 digits to build a number system. It is a rather arbitrary decision, really, to use 10 digits. In fact, many civilizations throughout history toyed with using a different number of digits to build numbers. The most relevant of these systems to our story is binary, where we use a measly 2 digits to build numbers. So, the digits of binary are limited to 0 and 1. You may be asking, how am I meant to build any number with just those two choices? Pretend we have some random and familiar number, say 23. How would we represent that number if we only have a 0 and a 1 to choose from? Well, the key is to think of the powers of two. As any elementary exponents lesson will tell you, some initial powers of two are: 20, 21, 22, 23, 24, 25. These numbers are really just 1, 2, 4, 8, 16, 32. Now, the key to building numbers in binary is to consider each of these powers of two to be either "on" or "off". The way we indicate on is with a 1 and we indicate off with a 0. So, when we want to obtain our chosen number, we first determine the sum of powers of two that yields 23. This is 16 + 4 + 2 + 1. Now, all that we have left to do to write this number in binary is to turn on all the slots that we need, namely 16, 4, 2 and 1, and to write this number in that particular order. This means that the 24 slot is on, but the 23 is off, 22 is on, 21 is on and finally the 20 is also on. When we write this number out, it yields the translation of our familiar number 23 to 10111 in binary. While we humans might have the luxury of being able to interpret and understand different number systems, modern computers only understand two states, namely our 0 and 1. This is where the binary system works exceedingly well, since computers excel at interpreting binary values. In conjunction with a system of logic that underlies all computers called Boolean algebra, named after the mathematician George Boole, we can assign to each binary number a symbol or instruction. 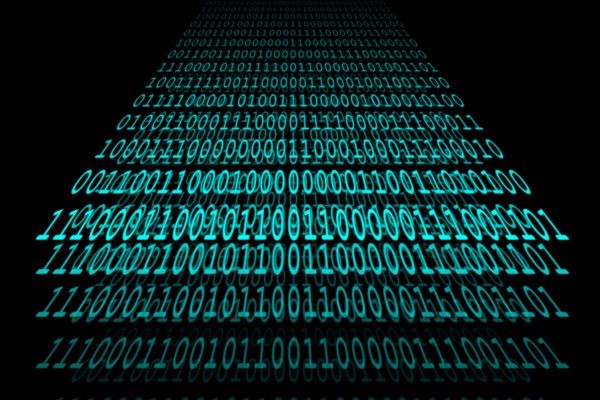 Then, when the computer is fed a string of binary numbers, it is able to decode those numbers into letters, or symbols or instructions that allow the creation of all that you see on your computer screen. The digital world certainly shows no sign of abating, everyday becoming more complex, more layered, even more human. As our lives become ever more intertwined with this digital realm, perhaps this technological evolution is not that surprising after all. The notion of binary, of 0's and 1's, of two parts, really is inherent in all we know. The sum total of all human experience exists within a duality, just consider: male and female, day and night, black and white, love and hate, hot and cold, finite and infinite. The world as we can only hope to know it is as simple as the yin and the yang, a truly binary experience. Next Can Our Oceans Survive the Acid Attack?